Meal Prep Sunday is all the rage right now in health and fitness. Get some great ideas for MPS from DealDash. Prepping your meals for the week on a Sunday is an excellent use of your time, and will make the rest of your week easier. The idea behind Meal Prep Sunday (MPS) is to prep as many healthy meals as you can within a few hours on a Sunday. Next, you divide them into containers and you have nourishing meals all set to go for your hectic work week. Prepping all of your meals on Sunday will save you both time and money. Here are some ideas from DealDash for MPS. Burrito bowls are delicious, filling, easy to make, and can be healthy if you choose the correct options. Want an interesting meal for MPS? Burrito bowls are a great choice for MPS. Here are the basic instructions, but feel free to change up the ingredients to suit your own tastes. Thanks so much for reading this DealDash article on Sunday Meal Prep. Don’t forget to check back every day for new articles here are well as on our sister blog, DealDash Tips. If you have any requests for specific articles, please feel free to leave a comment below. Now that you’re ready to cook be sure to go check DealDash for pots & pans, knives, cutting boards, and more. DealDash has all of the items that you need. VisitDealDash now to see how much you can save. Good luck and happy bidding everyone! This entry was posted in Uncategorized and tagged cooking, Deal Dash, DealDash, DealDash Auction, dealdash auctions, dealdash.com, healthy, meal prep, recipes on February 28, 2017 by . At the mention of vinegar you may think, “Eww, that stuff smells so horrible!”Then, perhaps you might find yourself starting to crave pickles. Mmm…pickles. Well, vinegar is good for more than turning cucumbers into a crunchy, juicy, and delicious snack. Let DealDash tell you about a few of the many uses of vinegar in the home. You would think such an awesome and useful product would be pricey, but vinegar is CHEAP! At just a couple bucks a gallon you can have an all-purpose, environmentally friendly cleaner replacing several of your household cleaning products. I’m going to share with you a few ways that you can you use vinegar in your household. Have your children or grandchildren decided to make the walls a canvas for their masterpiece? Don’t fret. Vinegar will clean that right up. Spray or dab some white vinegar on the crayon marks and let sit for a minute. Then using a light scrubbing motion the colored wax should come right off. A couple of years ago my children made the worst crayon mess at Grandma’s house when my husband and I were out. We returned to poor Grandma scrubbing the walls. When I showed her the vinegar tip she was amazed. When it comes to laundry, vinegar really carries the load. Vinegar benefits your clothes from the washer to the dryer. Adding about ½ to 1 cup of white vinegar to your clothes in the wash does several things. The vinegar helps eliminate stains, gets rid of odors, brightens the clothes, and acts as a fabric softener. In the dryer, vinegar keeps lint from attaching to your clothes and makes them static free. Personally, I hate the feel of fabric softener sheets. I refuse to touch them unless I put a sock on my hand! However, when you use vinegar in the dryer there’s no need for them! Whew! While you may be able to train Fido to stay off the couch, Whiskers answers to no one. To keep your pets off the furniture, all you need is a spray bottle filled with vinegar. Spray it across wherever you want the pets to steer clear. They hate the smell of vinegar. Spraying approximately once a week should do the trick, but if you notice a more frequent need, spray every few days. The vinegar smell will fade to humans as it dries, but our animal friends will still be able to smell it for a week or so. Thanks so much for reading this DealDash article on the uses of vinegar in the home. Don’t forget to check back every day for new articles here are well as on our sister blog, DealDash Tips. If you have any requests for specific articles, please feel free to leave a comment below. Now that you have home care on your mind be sure to go check DealDash for candles, art, storage and more. DealDash has all of the items that you need. VisitDealDash now to see how much you can save. Good luck and happy bidding everyone! This entry was posted in Uncategorized and tagged cleaning, Deal Dash, DealDash, DealDash Auction, dealdash auctions, dealdash.com, home, home care, vinegar on February 27, 2017 by . 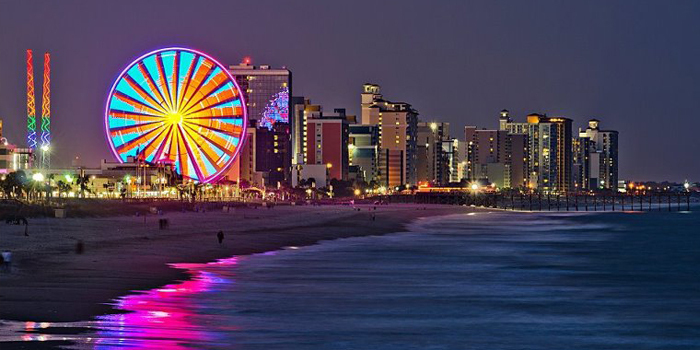 Have you ever taken a trip to Myrtle Beach, SC? It’s not just for golfers anymore. Let’s explore with DealDash. Growing up in Wilmington, NC was great, because so many nice vacation spots were just a short car ride away. One of these spots is Myrtle Beach, South Carolina. 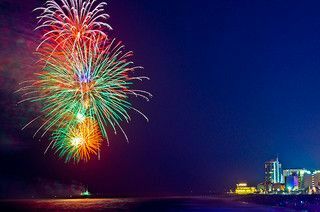 Just 1.5 short hours from where I grew up lies miles of beautiful beaches, a boardwalk with an amazing ferris wheel that has enclosed seats with AC(! ), a Ripley’s Believe it or Not museum, multiple haunted houses, and so much more. 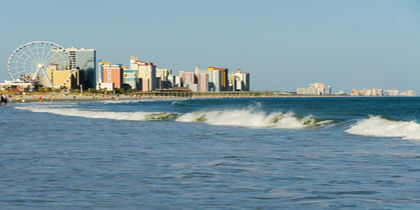 Here are a few fun things to do in Myrtle Beach, from DealDash. Going to the beach is always a favorite activity when on a trip, and Myrtle Beach has many beautiful ones to explore. If you don’t mind paying a few dollars, skip the public beach access points and hit up the Myrtle Beach State Park on the southside of town. It costs $5 per adult and $3 per child (under 5 kids are free) to get in, but then you have wide stretches of beach to yourself with less competition for a spot to put your beach towel. For the entry fee you also get access to hiking trails, a fishing pier, picnic shelters, and a nature center. When I was growing up in the south I had a few of my own up close and personal adventures with wild crocodiles, but Alligator Adventure is safe and supervised. There are more animals there than just alligators such as monkeys, birds, snakes, and more. The entrance fee is a little steep at $17.99, but well worth it in my opinion. After you’ve done the beach and kid’s activities all day, maybe it’s time for something a little more grown up. See a variety of concerts from Broadway to gospel, rock, country, and more at the Carolina Opry. There are also special events such as comedy shows, dancing performances, and lots of other entertainment. The tickets start at $50, though, so choose your show wisely. Thanks so much for reading this DealDash article on Myrtle Beach, SC. If you’re excited about visiting Myrtle Beach, maybe you should visit DealDash first to get some new luggage! DealDash can help you with luggage, laptop cases, toiletry bags, and more. Now that you have traveling on your mind be sure to go check DealDash for luggage and airline gift cards. DealDash has all of the items that you need. VisitDealDash now to see how much you can save. Good luck and happy bidding everyone! This entry was posted in Uncategorized and tagged bag, DealDash Auction, dealdash auctions, dealdash.com, holiday, luggage, myrtle beach, sc, south carolina, suitcase, travel, trip, vacation, vacay on February 24, 2017 by .